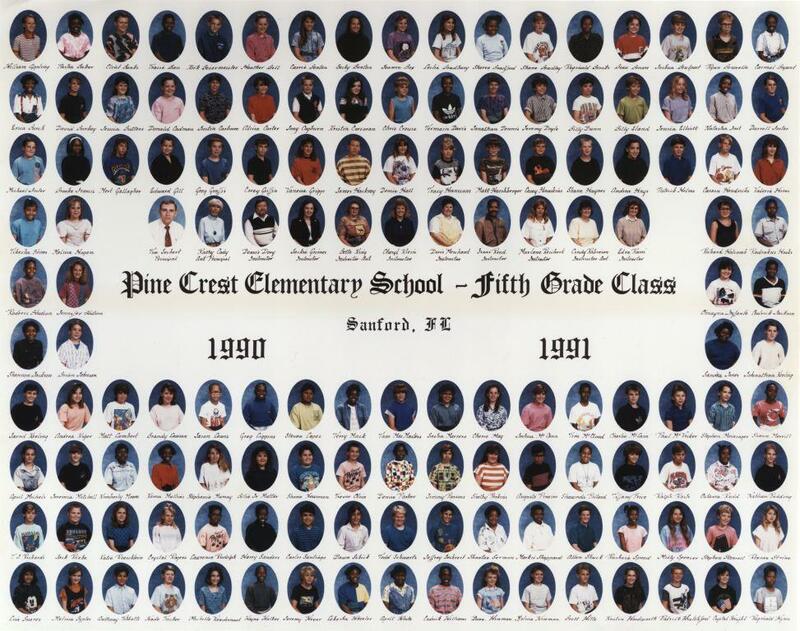 Pine Crest Elementary School fifth grade teachers and students for the 1990-1991 school year. The principal for the school year was Tim Seibert and the assistant principal was Kathy Cody. Pine Crest Elementary opened in 1955 at 405 West 27th Street in Sanford, Florida. The school was built in order to accommodate the growing population of baby-boomers that led to overcrowding at Southside Elementary and Westside Grammar Elementary School. Margaret Reynolds, the daughter of the owners of Kader's Jewelry store on Park Avenue, was the school's first principal. Several of the teachers and staff at Southside, including Reynolds, transferred to Pine Crest when it opened. Original color photograph: Private Collection of Christine Kinlaw-Best. Woodworth, Darlene. Interviewed by Autumn Reisz. UCF Public History Center, HAR 1063413P. March 2, 2013. Audio/video record available. UCF Public History Center, Sanford, Florida. Copyright to this resource is held by Pine Crest Elementary and is provided here by RICHES of Central Florida for educational purposes only. "Pine Crest Elementary." Pine Crest Elementary, Seminole County Public Schools. http://teachercenter.scps.k12.fl.us/education/components/scrapbook/default.php?sectiondetailid=60912&&PHPSESSID=62be91cca7519540463cfa5be7e5eecf. "About Us." Pine Crest Elementary, Seminole County Public Schools. http://www.pinecrest.scps.k12.fl.us/Home/QuickLinks/AboutPineCrestElementary.aspx. Swann, Patty Johnson. "I Remember Pine Crest From 1955-2004." Sanford Historical Society, September-October 2005, 1 and 4. http://sanfordhistory.tripod.com/newsletters/sep2005.pdf. 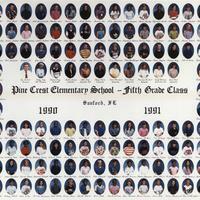 “Pine Crest Elementary Fifth Grade Class, 1990-1991.” RICHES of Central Florida accessed April 19, 2019, https://richesmi.cah.ucf.edu/omeka/items/show/1517.